It looks like a match stick, but it tells you the temperature. Hook this to a resistor and connect to your Arduino analog input pin. The voltage will vary with temperature. 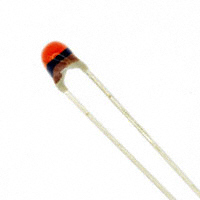 We even include a 10k resistor with this part so you can easily make a voltage divider and connect it to your Arduino board. See our Arduino Thermistor Tutorial for instructions on using this sensor with your Arduino. 10k Ohm resistance at 25C. Uses only 1 analog input pin on the Arduino or other microcontroller. Measures temperatures from -40°C to +125°C (-40°F to +257°F).